It was in last year’s SEMA that Chevrolet first displayed a concept version of the 2012 Camaro in full COPO trim and now, just a couple of days back, it has announced that it is going to produce the car, though in very limited numbers. If you are a drag racing fan then you must know that back in the sixties, the Chevrolet’s special order vehicle division, called Central Office Production Order (COPO), became famous for the performance oriented Camaros it built, with the intention of turning them into full-fledged Stock Eliminator racers. 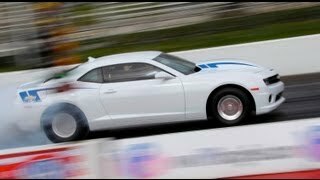 Now after more than 50 years, Chevroletis planning to do the same with the 2012 Copo Camaro. 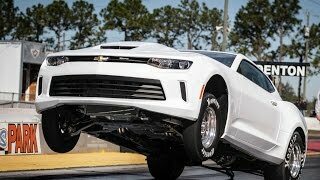 Only 69 units of this vehicle would be built and it would race in the NHRA’s super stock and stock eliminator classes where it will take on the likes of the Ford Mustang Cobra Jet and Drag Pak Dodge Challenger. The new COPO Camaro will come in three engine options. It includes a LS7 based naturally aspirated 427 (7.0L) V8, an LSX based supercharged 327 (5.3L) V8 with a 2.9L supercharger and another LSX based 327 (5.3L) V8 with a 4.0L supercharger. These vehicles will be built using the “body in white” body structures which are produced at Chevrolet’sOshawa plant in Ontario. The engines will be mated to a Powerglide automatic transmission which has been specifically designed for drag racing. The car will be available in five color options – Summit White, Silver White Metallic, Flat Black, Victory Red and Ashen Gray Metallic. Those willing to take one of these home and then to the drag racing track should contact their Chevrolet dealer ASAP. Delivery of these cars will begin this summer and the base price for one of these has been kept at $89,000. DETROIT – Chevrolet will build 69 COPO Camaros for 2012, the brand’s first purpose-built Camaro drag-racing specialty car designed to compete with the quickest in NHRA’s Stock Eliminator and Super Stock classes. National records for quarter-mile times in these contests are in the nine-second range. As such, the COPO Camaros are expected to be the quickest Camaro ever offered by Chevrolet. The 69-car production for the 2012 COPO Camaro matches the number of “ZL-1” COPO Camaros made in 1969. COPO stands for Central Office Production Order and was Chevrolet’s special-order system in used by dealers to build high-performance models in the 1960s. 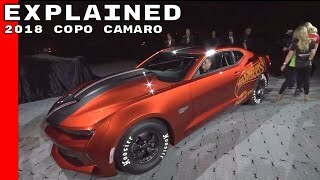 The new COPO Camaros will be built using factory “body-in-white” body structures produced at the Oshawa, Ontario plant that manufactures regular-production Camaros. They are the same body-in-white body shells available to all racers under Chevrolet Performance part number 19243374. Customers will order and complete the transaction for their COPO Camaro at their preferred Chevrolet dealer with delivery at the General Motors Performance Build Center in Wixom, Mich. Deliveries will begin early this summer. 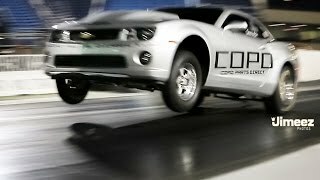 The COPO Camaro concept was first shown at the 2011 Specialty Equipment Market Association (SEMA) show in Las Vegas, where the overwhelming response by more than 2,000 racing enthusiasts shaped the decision to produce a limited number of COPO Camaros. To ensure fair access to the limited number of COPO Camaros, an independent third party was used to identify the first individuals who would be offered the opportunity to buy one of the new COPO Camaros. Those selected will receive a confirmation letter with instructions on how to fulfill the purchase contract, choose the engine option for their intended racing class, and take delivery. The COPO Camaro is designed to NHRA racing specifications including a solid axle and a full chrome moly roll cage. Inside, most of the standard sound deadening and power accessories have been deleted in order to optimize weight for NHRA racing. Also included is a pair of racing bucket seats (no rear seat), a safety harness for the driver, a competition floor shifter and Chevrolet Performance gauges. The 2012 COPO Camaro is being offered as a performance part, with a specific part number (P/N 20129562). It cannot be registered, titled, licensed, or driven on public roads or highways. 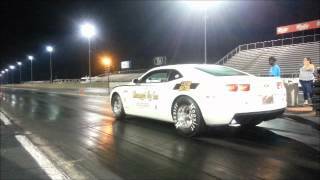 COPO is specifically offered for off-highway, competitive NHRA use only.